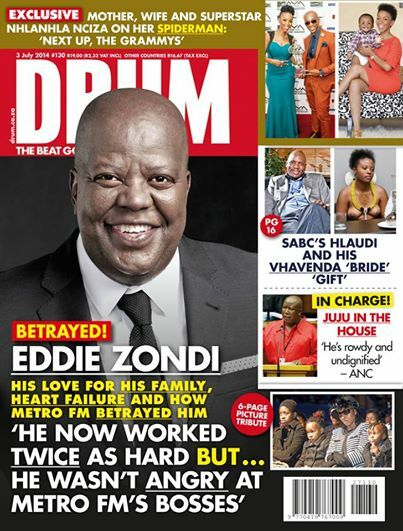 Eddie Zondi send-off: A little too late for Metro FM? When Eddie Makhosonke Zondi was laid to rest, countless colleagues, friends and fans paid tribute to the radio legend. But is it a case of too little too late for Metro FM? His SEND-OFF was unprecedented. His contribution to broadcasting was acknowledged both internationally and locally by President Jacob Zuma in Parliament. And three government ministers attended his farewell ceremonies: Arts and Culture Minister Nathi Mthethwa gave a heartfelt tribute at his memorial service at the Standard Bank Arena, and former Gauteng Premier and now Minister of Water and Sanitation Nomvula Mokonyane together with Minister of Sport and Recreation Fikile Mbalula attended his funeral. Eddie Makhosonke Zondi (47) was a legend! Following a week of tribute shows and mourning on his “home-from-home”, Metro FM, thousands of teary-eyed fans said their final farewells last Sunday. His cult following started some 18 years ago when he joined Metro FM and became one of the lead presenters on the station. Each and every one of us can remember a mellow Sunday afternoon spent with family and friends, with Eddie’s voice in the background as he played soulful music. Whether you were studying, had just fallen in love, were going through a break-up or whatever your struggle, Eddie’s voice and his other love, his music, were always there for you. Read more in DRUM – 03 July, 2014.